Music festival Kasauli rythum and blues music festival kasauli took of today at the Baikunth Resort today. Kasauli Rhytm and Blues music festival is an annual music festival held in Kasauli, Himachal at Baikunth Resort. This Music Festival was conceived by Genesis Foundation in 2012 with a view to grow its community of donors and well-wishers. Believing strongly that music is a positive and participatory force in the creation of change, the Foundation invites established and upcoming artistes from India’s diverse pool of musical talent. They perform for our cause – to support critically ill, and under-privileged children suffering from Heart Disorder. Music aficionados can contribute for the cause by simply doing what they love best – listening to music! Genesis foundation was started after its Founders Prema and Jyoti Sagar lost their child to Heart Disorder – Samir, who was born on December 20, 1983. It took them a long time to recover from this tragic loss. They began working at Missionaries of Charity. It gave them a whole new meaning to life, and this is how the journey started as they felt they could reach out and assist in the best way possible – enriching the lives of others and their own. Now – there is no end to this journey to save more and more little hearts. A turning point came when a tea stall owner in a drunken stupor threw his son into a dry well. Only seven years old, he broke or dislocated every major bone in his body. He was taken to an orphanage and then with the help of an American lawyer – Eugene Mihaly, GF reached out to Ravi and contacted Shriners Hospital for Crippled Children in the US where he underwent multiple surgeries along with physiotherapy. He too, found a happy ending within an American family who adopted him, and welcomed him with open arms – he has been to school and even learnt how to swim! The success of these two experiences paved the way for a more structured organization in the form of Genesis Foundation, where we strive to truly Give Life a Chance. The Kasauli rhythm and blues festival is to take place on the 30th of march 2018 at the Baikunth Resorts kasauli. Kasauli Rhythm and Blues (KRBF) is held by Genesis Foundation. The annual music festival is running its 7th edition. 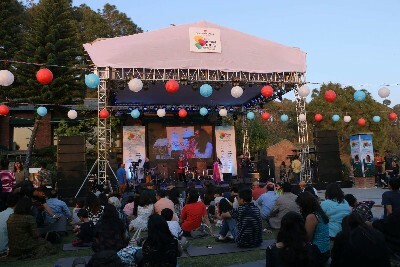 A mecca for music enthusiasts interested in listening to a diverse pool of established and upcoming talent, the festival has delivered some of the most exceptional live performances – from the mesmerizing Usha Uthup, Shilpa Rao, Lesle Lewis, Rabbi Shergill to the flavorsome Sonam Kalra and Kutle Khan Sufi Collective amongst others in the past. Join us this Easter weekend of March 30- 31, 2018. Rabbi Shergill also known as Gurpreet Singh Shergill, born in 1973 is an Indian musician well known for his debut album Rabbi and the chart-topper song of 2005, Bullah Ki Jaana. His music has been described variously as rock, Punjabi, with a bani style melody. He is to perform at the 2018 Kasauli rhythm and blues festival. When Chai Met Toast takes inspiration from the lighter side of life to create music that is heart-warming, happy and smile worthy. The newest band from the land of coconuts, they gained fans quickly with a special acoustic setup and a unique brand of infectious happy music, which transcends age, genre and even language. They are to perform at the Kasauli Rhythm and Blues 2018. A collaboration between Aditya Jassi (lead singer, songwriter and guitarist), Manish Gunthey (singer and guitarist), Ashwani Verma (drums) and Abhay Sharma (saxophone). The band performs a mix of Bollywood contemporary covers and retro Hindi music, English pop, rock and contemporary music. Unplugged entrals audiences with their outstanding musical performances. Recently, they opened for singer Guru Randhawa at India’s Biggest Food Festival – The Grub Fest. Other venues they have also performed at are The Flying Saucer Café, Monkey Bar, Depot 48, The Electric Room and Farzi Café. Sonam Kalra & The Sufi Gospel Project, is the brainchild of singer and lead vocalist Sonam Kalra. The music they produce blends together the many voices of language, religion and music to create one voice- the voice of faith. Their sound is fresh and unique and in fact, Sonam has created a new genre with The Sufi Gospel Project. It is called a ‘project’ because the music the band produces is ever evolving and an exploration of this genre. Anshu Mor, former head of Xbox division for Microsoft India has indeed left his swanky corporate job to become a standup comedian. But don’t mistake him for the typical corporate tech geek bored at his job. He clarifies he enjoyed every bit of his job at Microsoft but he just wanted to follow his passion. The line-up for the 5th Kasauli Rhythm and Blues Festival, promises to be as exciting, if not more, and amazing bands and musicians will enthrall the audience with a mix genre of music—Western, Sufi, fusion and Bollywood! And best of all, you get the chance to meet our ambassador Dia Mirza who will join us at Kasauli. Massive Vibe Live! : Worldwide concert tour production and lyrics by Queen Be! The donor card includes entry to the festival and a complimentary bar and beverages on two days i.e. March 25-26, 2016.